We have the winners of the color experiments! I have the dye all mixed. 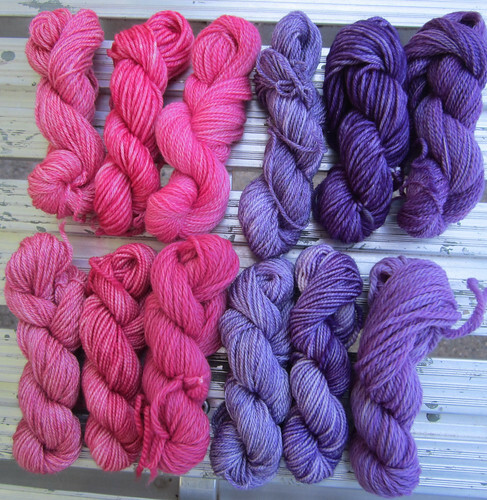 The yarn is all skeined. 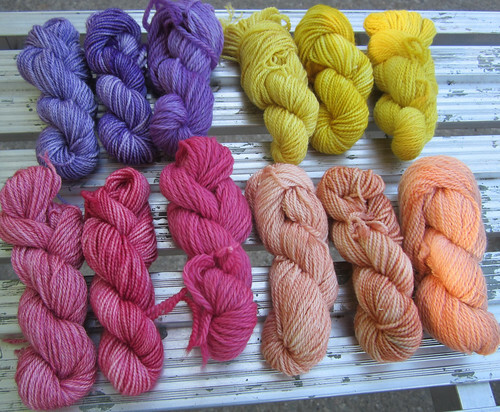 Dyeing to commence in the next day or two. I haven’t picked out names yet but was offered a few good suggestions from Kristi (I especially liked Varying Violet). I think I have decided on the yellow one though. I looks so much like Summer Squash to me that I think that’s what it has to be. Peach sounds a little boring, even though that’s what it is. I will have to come up with something better than that. Maybe Southern Peach? hmm… I have nothing on the pink one. I will see what I think when I see the full size skeins I suppose. Feel free to add any suggestions for any of the colors in the comments. I will welcome any help! 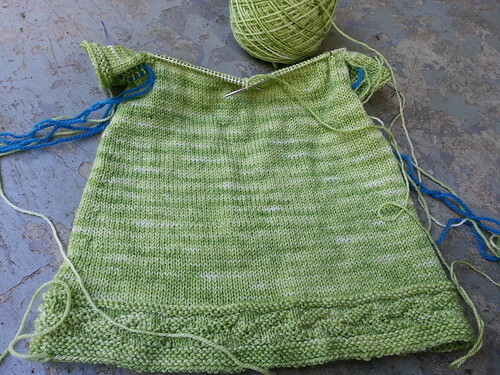 On to knitting progress minute though it may be. I can not believe this is the sum total of my knitting since the end of April. Sheesh. As you can see I have finally gotten to the home stretch on my small Sorrel. I have started the yoke at last. Yay! I have had Cosmos that shade of pink, as well as my Endless Summer hydrangea. Our soil is “sweet” we can’t grow blue ones. Oh really? Interesting. Our hydrangeas are usually purple or blue. You are right about the Cosmos. I hadn’t thought of that. Hmm..